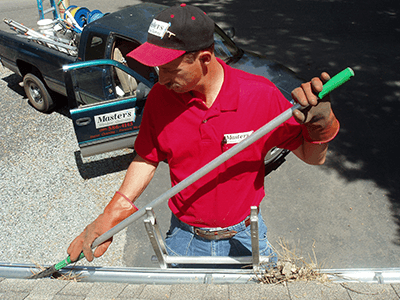 Gutter Cleaning in Sacramento, California | Masters | Master's Window and Gutter Cleaning Inc.
WE INSTALL SLIMGUARD GUTTER PROTECTION - CLICK HERE TO LEARN MORE! Your gutters are the primary line of defense against flooding. A clean set of gutters functions to channel water away from your roof and your home, while clogged gutters can cause leaks, water damage, and much more. Usually, gutter cleaning is recommended about every six months. Leaves, twigs, dirt, sticks, and other debris such as nesting materials must be removed from your gutters regularly for proper functionality. But gutter cleaning can be dangerous, especially if you are not comfortable with heights. So don’t go it alone. At Master’s Window Cleaning, we don’t just offer window cleaning, pressure washing and house washing in Sacramento, El Dorado Hills, Elk Grove, Folsom, and Roseville CA – we also provide comprehensive gutter cleaning services! 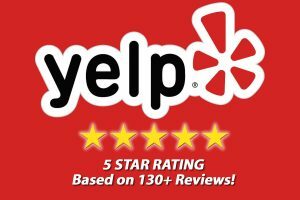 With our professional cleaners, expert service, and 100% satisfaction guarantee, you can trust us to deliver great results. Learn more about gutter cleaning below. What Can Happen If I Don’t Clean My Gutters? Water overflows are common in clogged gutters. When they are blocked, water starts to flow over the sides, instead of through downspouts. This may channel water towards your siding, resulting in water damage and leaks. Gutters are meant to tolerate flowing water, not heavy loads of soaked debris. If they are clogged, and a rainstorm causes water to soak into debris, they could fail completely, and rip from their mountings – requiring you to remount or replace them. Your roof and your gutters are supposed to work together to keep your home dry and leak-free. 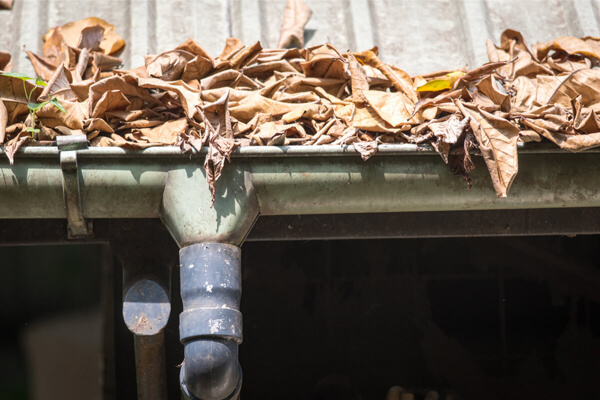 If your gutters are too clogged to channel water properly, water may not be able to escape, and it will begin to sink through the edges of your shingles, and soak the underlying roof structure. At first, this problem may not be obvious – but if it progresses, you may need an expensive partial or total roof replacement. Why Choose Master’s Window Cleaning For Gutter Cleaning Services? We can usually clean gutters in 1 to 2 hours! We have cleaned thousands of homes, and can usually clean your gutters in just 1-2 hours. DIY gutter cleaning can take you much longer – requiring you to spend more time on ladders, or standing on your roof. More than 500,000 people are treated each year for ladder-related injuries, according to the American Academy of Orthopedic Surgeons. If you’re not experienced at working with a ladder, you could be in danger of injuries if you try to take on a DIY gutter cleaning project. This is not just some empty marketing claim at our company. We have built our business on customer satisfaction. If you are unsatisfied – in any way – with our services, we will do everything that we can to make things right. That’s a promise. Get Started With Gutter Cleaning Services Today! Interested in gutter cleaning services, as well as the other services we offer at Master’s Window Cleaning? Check out our Home Maintenance Packages. You can have the peace of mind that your house will always look great and be taken care of throughout the year. We’ll take care of everything for you! Still not convinced that we’re the best company for you? Take a look at a few of our customer testimonials – we know you’ll be impressed with what you see. Contact us by phone for an appointment at 916-844-6041, or get in touch with us online now!